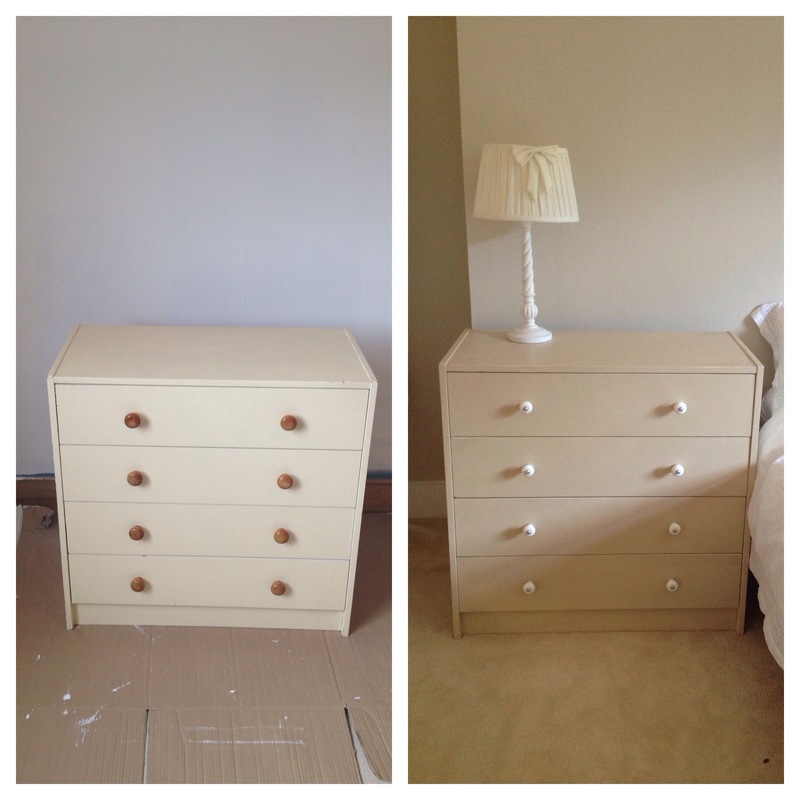 Dotty’s First Solo Furniture Transformation! Husband and I moved to our first House in June this year (we also became pregnant later in the same month, but that’s another story!) and I had been itching to get going on some furniture overhauls. We started by painting our pine bed frame, which was made maaaaany years ago by my father in-law. Husband helped me with that and another blog post will follow. Shortly after, I took on my very own project, inspired by Annie Sloan’s book, Colour Recipes.This was bought for me by my Bother A’s friend, who had just restored a lot of furniture and adores the book. My Brother told her all about me, my new house and my love of craft and she literally ran out to get me a copy, despite never having met me. So sweet! Thank you very much Simone, I love the book! The item to be painted was a chest of drawers that Husband had in his bedroom when he was a little boy. I think his Mum even gave it a facelift when he was still young and now it was my turn! After a quick wipe down I started with a coat of Old White. No sanding required with these paints, amazing! As I was painting on a glossy surface the first coat went on lovely and smooth. Next I did a coat of Old Ochre, this time because I was now painting on a coat of chalk paint there was more friction and I had to use more paint to get the right coverage and an even finish. Once dry I used part of a scourer (DIY shop was closed!) to chip some of the top coat off of some edges, revealing the Old White underneath and giving an aged look. Lastly I used a soft old towel to work in some soft wax to protect the furniture and then added on some new handles from Ikea, which were cheap, but look lovely I think! I’m all about 50 shades of beige at the moment and am loving the muted, calming tones in our bedroom.